Tag line: "Have the adventure of your life keeping up with the Joneses"
After the darkly violent Indiana Jones and the Temple of Doom, Steven Spielberg and company return to the series’ roots with 1989’s Indiana Jones and the Last Crusade, a fast-paced, occasionally funny action / adventure that sees our hero, Indiana Jones, once again battling it out with Nazis as he tries to track down a religious artifact: the fabled Holy Grail. 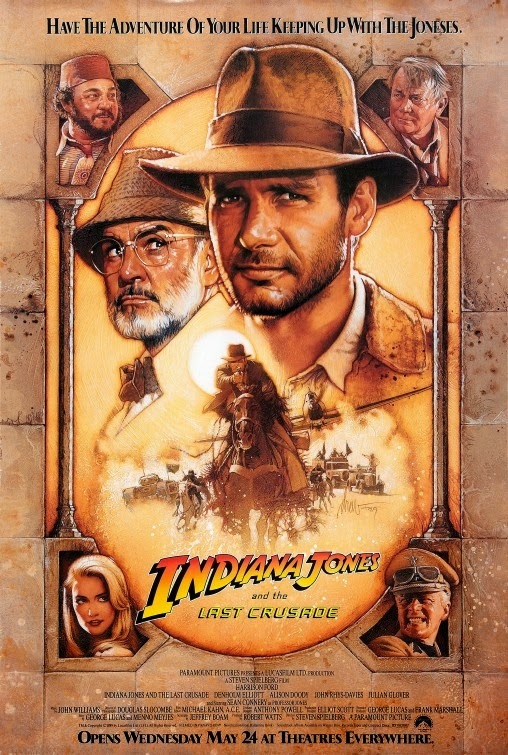 Following a flashback to 1912, where a much younger Indiana Jones (played as a child by River Phoenix), while on a scouting trip in Utah’s Monument Valley, tried to rescue the Cross of Coronado from profiteers, we leap forward to 1938, when Indy (Harrison Ford) is approached by antiquities collector Walter Donovan (Julian Glover), who, for years, has been looking for the Holy Grail. Believed to be the cup Jesus drank from at his Last Supper, the Grail went missing (or was hidden away) during the First Crusade, when, according to legend, a trio of Knights (all brothers) stumbled upon it. Since that time, many men have searched in vain for the Grail, including Indiana Jones’ father (Sean Connery). A lifelong Grail historian, the elder Dr. Jones was working for Donovan when he abruptly disappeared. To add to the mystery, Indiana receives a package in the mail that contains his father’s diary, a small notebook filled with clues about the Grail’s possible resting place. Convinced that dear old dad is in trouble, Indiana and his mentor Marcus Brody (Denholm Elliott) hop a plane to Venice, where the elder Dr. Jones was working when he vanished. Joined by his father’s assistant, Dr. Elsa Schneider (Allison Doody), Indiana finds himself drawn into the search for the Holy Grail, which, like the Ark of the Covenant, is also being sought by the Nazis. Will Indiana Jones save his father and locate the Grail in time, or is the sacred chalice destined to fall into Hitler’s hands? Like Raiders of the Lost Ark, Indiana Jones and the Last Crusade features lots of pulse-pounding action, from its clever flashback sequence (when we learn, among other things, why its lead character is afraid of snakes) to a thrilling chase in the desert of Hatay (where Indy faces off against a battalion of Nazis and a tank). Assisted by some familiar faces (along with Denholm Elliott’s Marcus, Indy teams up with Sallah, his cohort from Raiders of the Lost Ark portrayed by John Rhys-Davies), our hero also joins forces with his own father, a partnership that, aside from introducing a little family drama into the mix, results in a handful of funny scenes (unlike his son, the elder Jones isn’t much of an adventurer, and is more comfortable wielding a book than he is a firearm). Ford and Connery are excellent as the two Joneses (their chemistry was so good that I had no problem whatsoever believing they were father and son), and the fact they spend so much time together is a definite plus. And to top it all off, Indy gets another crack at the Nazis, this time taking the fight all the way to Berlin (where he has a close encounter with the Fuhrer himself)! Chock full of insane action sequences and tongue-in-cheek humor, Indiana Jones and the Last Crusade is a throwback of sorts to Raiders of the Lost Ark in that it’s a hell of a lot of fun to watch. Of the Jones films, I only superficially liked the first one, and that was in spite of itself. I think I enjoyed some of the period-pulp tropes the writers used. Other than that, I have not liked any of those movies, at all. When I watched the later ones, it was long after they were released and with not a little shock at how awful they are. I have rather enjoyed all of the Indiana Jones series, for me they bring back great childhood memories. I saw 2 and 3 at the theatre . Would like to see them come out with another one.